First introduced in Jelly Bean 4.1, Google Now is one of the most interesting additions to the OS. Google's voice-activated personal assistant is in the same neck of the woods as Apple's Siri, but it learns constantly from your daily routines. It's accessed by holding the home button and gives you short overview of information it believes is relevant to you right now in the form of cards. Going to work in the morning? Google Now knows this and lets you know there's a big traffic jam on your usual way to the office, so it offers you a re-route. Google Now has been getting smarter and, if you allow it, can scan your email for upcoming flights, deliveries or restaurant reservations and duly notify you. There are also numerous kinds of cards like birthdays (yours and those of your contacts) and what distance you've walked in a particular month. The last one could definitely feel creepy for some users, but it's easily turned off in the Google Now settings menu. The latest addition to Google Now cards are TV and Offers. One big advantage of since Jelly Bean is that dictation doesn't require an internet connection to work. You can dictate text anywhere in the interface where the on-screen keyboard is available - be it Messaging or a note taking app - without the need for a data connection as long as you have the required language packs installed (and those only take about 20-25MB of your storage per pack). 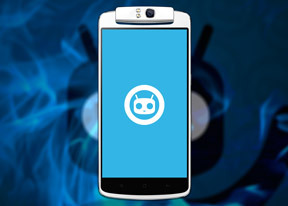 The CyanogenMod Oppo N1 has a Snapdragon 600 chipset, which is not exactly top of the range any more. The Snapdragon 800 is already powering a dozen flagships, while its Snapdragon 805 successor is just around the corner. So let's dig right into it. Starting off with BenchmarkPi and Linpack. Both focus on the processing skills - BenchmarkPi focuses on individual cores while Linpack measures multi-threaded performance. In both cases the Oppo N1 performed as expected - matching its Snapdragon 600 peers and falling somewhat short of the Snapdragon 800-powered beasts. Linpack is putting all four Krait 300 cores to the test and the CyanogenMod Oppo N1 didn't do as well as its ColorOS sibling. The next benchmark we ran is GeekBench 3. It measures CPU and memory performance and, interestingly, the CyanogenMod version of the Oppo N1 scores significantly higher than the ColorOS one here. Quadrant and AnTuTu gauge the overall device performance. Here CyanogenMod Oppo N1 scored close to the regular version. In AnTuTu 4 it managed to get almost exactly the same result as the Snapdragon 800 packing Nexus 5. It's time to test the Adreno 320 graphics performance. The CyanogenMod Oppo N1 scores a solid 20fps under the ColorOS variant of the phone and is ranking near the HTC One. We ran the GFXBenchmark off-screen at 1080p resolution in order to test the raw power of the Adreno 320. It turned out just as powerful as the regular Oppo N1. The CyanogenMod Oppo N1 did well at the compound BrowserMark 2 test, and even managed to get very close to the more powerful Samsung Galaxy Note 3.